The residents of Russia’s Amur region woke up Sunday morning to notice an unusual celestial phenomenon – a shining object flying through the sky, leaving a white trail that some social media users compared to the Nike logo. “[The trace of the alleged meteorite] looked like a trace of the plane, only bigger and much brighter,” an eyewitness from the city of Belogorsk in the Amur region in Russia’s Far East told the local Amur.info website. The swoosh was seen near one of the military units in the city. The object then exploded but the thunderclap-like sound was heard only eight minutes later, people said. However, the object didn’t cause any destruction, and even window framed didn’t rattle, witnesses said. 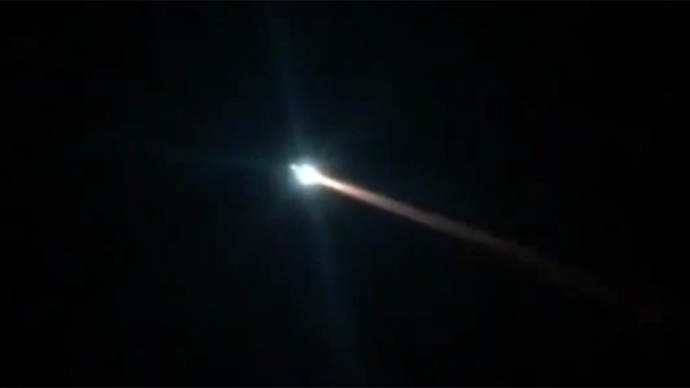 They claimed the object was a meteorite, though local authorities haven’t confirmed it yet. The object was also spotted from the city of Blagoveshchensk in the Amur Region, which is 115 kilometers from Belogorsk. Social media users were actively commenting on the phenomena, sharing photos. “It seems to me that Nike, Inc. was the sponsor of this meteorite, “said Twitter user ‏@spartak737, referring to its resemblance to Nike's logo.